Beauty mistakes, beauty mistakes? I've genuinely been trying to remember what beauty mistakes I've made asides the one time I used a foundation that was too red, the other time the foundation was too light, that one time when my lip liner wasn't blended in properly, what of that time when I tried to use do an ombre lip and it ended up looking like a can of coloured soup and some others...but I genuinely can't remember the beauty mistakes I've ever made. Guess that's why I'm a pro now right? Anyway, there are those who make mistakes all the time and it is usually within any of these and pretty often too. We don’t wake up one day with a steady hand and the knowledge on how to execute a flawless contoured face. Sadly makeup skills can’t be gained through osmosis. It requires practice and remembering a few helpful hints. It takes a bit of experimenting which results in a few awkward makeup looks. 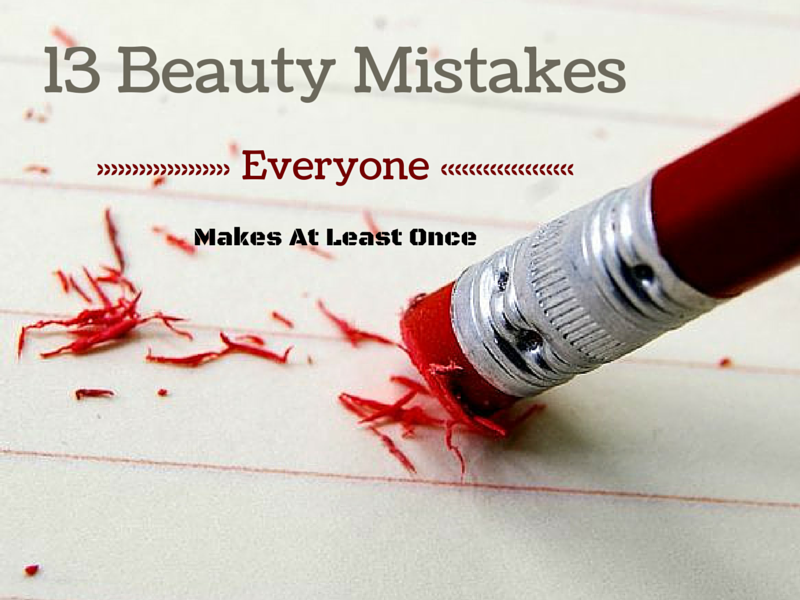 Everyone has made makeup mistakes. It’s the only way to figure out what works and what doesn’t. After you see a photo of yourself where you neck is a completely different color than your face, you will probably not make that beauty mistake again. 1. Layering your mascara on too thick and getting clumpy lashes. You really wanted long, voluminous lashes so you kept on layering your mascara. Who needed false lashes when you had easy-to-apply mascara? You applied one coat too many and your once long and defined lashes turned into a clumpy, spidery mess. You can blame the 2000s over-plucked brow trend, or you can blame the fact that once you pick up a pair of tweezers and you just don’t know when to stop. What starts off as plucking a few stray hair turns into you tweaking your eyebrow shape and then before you know it half of your eyebrows are missing. 3. Caking on the foundation to get a “flawless” finish. It was easy to think the the more product you use, the more even your complexion would be. You didn’t consider that if you caked on your foundation you would end up with a face full of foundation. 4. Turning your smokey eye into a black eye. Creating the perfect smokey eye can be tricky. You have to layer on the shadow and blend them just so. In your beginner days, you probably thought the quickest way to a smokey eye was to slap on the black shadow and blend it out. It usually went from a smokey eye to a raccoon eye to a black eye. 5. Trying to cover a pimple and patting it down too much so you end up with a massive ring around your red pimple. When you wake up with a nasty pimple, you grab some concealer to cover it up. Your attempt to blend the product in results in you patting the concealer on your pimple one too many times. The result is a pimple with a perfect ring of concealer around it. Trying to correct it without washing your face results in a more prominent ring. 6. Using waaaay too much blush. You wanted to add a pop of color to your pale face so you put some blush on your cheeks. The only problem was you weren’t entirely sure where the apples of your cheeks were so you applied the blush to your entire cheek and didn’t really bother to blend it in. In some old pictures you look like a clown. 7. Not blending your makeup properly. You get caught up trying to apply all your different products in the correct spots that you forget to actually blend them with your skin. Your face ends up looking more like a stained glass project because of the obvious lines of where one color stops and another begins. 8. Creating two completely different shapes with your eyeliner and not realizing it. You spend 10 minutes on each lid getting your cat eye to be straight, sharp and pointing at just the right angle. After all of the work you don’t bother to compare both of your eyes. If you did, you’d realize one eye was a cat eye while the other one was more of a drooping puppy liner shape. 9. Wearing the wrong shade of foundation. It’s happened to the best of us. You either tested the foundation on your hand, you just looked at the package and guessed it was the right one, or you genuinely thought you had picked the right shade. Your different colored neck and daylight revealed that you had chosen the completely wrong shade. 10. Ending up with two different shaped eyebrows after you plucked them. Our faces aren’t perfectly symmetrical but you’d like your eyebrows to be similar. Sometimes it doesn’t work out so well. You pluck the stray hairs on one eyebrow then go to do the other and they end up with slightly different shapes, lengths or both. 11. Using too much brow pencil so your brows look completely fake. A little brow pencil goes a long way. You need a lot less than you think to get bold eyebrows to rival Cara Delevingne‘s. That didn’t stop you from coloring in your brows like they were a page in a coloring book. When you were done, your eyebrows look like fake mustaches stuck onto your forehead. 12. Trying to make your lips bigger with liner and ending up looking like a clown. If Kylie Jenner has taught us one thing, it’s that when used correctly lip liner can give us a seriously full pout. When used incorrectly, lip liner can make you look a crazy clown or like you have a nasty mouth infection. Rookies want the biggest bee-stung lips and their attempts often leads to strange, misshapen mouths. 13. Using so much powder that you look like a ghost. No one likes a shiny T-zone. When you see your greasy forehead in your compact mirror your reflex action is to grab your powder puff and dab it on to get rid of every shiny spot. After a few applications, your complexion is matte but you also look like you got attacked by a bag of flour. Next, time stick with the blotting sheets.